LAS VEGAS — HP today unveiled the second generation of the world’s first and only all-in-one workstation with a 27-inch diagonal display, the HP Z1, now available with Windows® 8 Touch and Intel® ThunderboltTM 2(1) capabilities—making it HP’s most powerful, innovative and fully featured all-in-one workstation. Ideal for knowledge workers and specialists in CAD, graphic arts and university education, the HP Z1G2 offers fast data transfer speeds for compute-intensive workloads and new technologies like Thunderbolt offer the flexibility for high-performance external expandability. Whether it’s being used by an engineer creating 3-D components, an architect designing buildings or a videographer editing event footage, the HP Z1G2 gives creative professionals the power they need to bring ideas to life faster. The HP Z1 G2 is joined by three new all-in-one PCs ideal for use in small and midsize business (SMB) and enterprise environments, including the HP Slate21 Pro All in One, HP’s first commercial Android all-in-one PC. The HP Slate21 Pro offers seamless integration with Android-based phones and tablets, along with access to efficient manageability tools, security enhancements and apps available through the Google Play™ app store. HP is the only workstation vendor to offer Thunderbolt as an option across both desktop and mobile workstations. 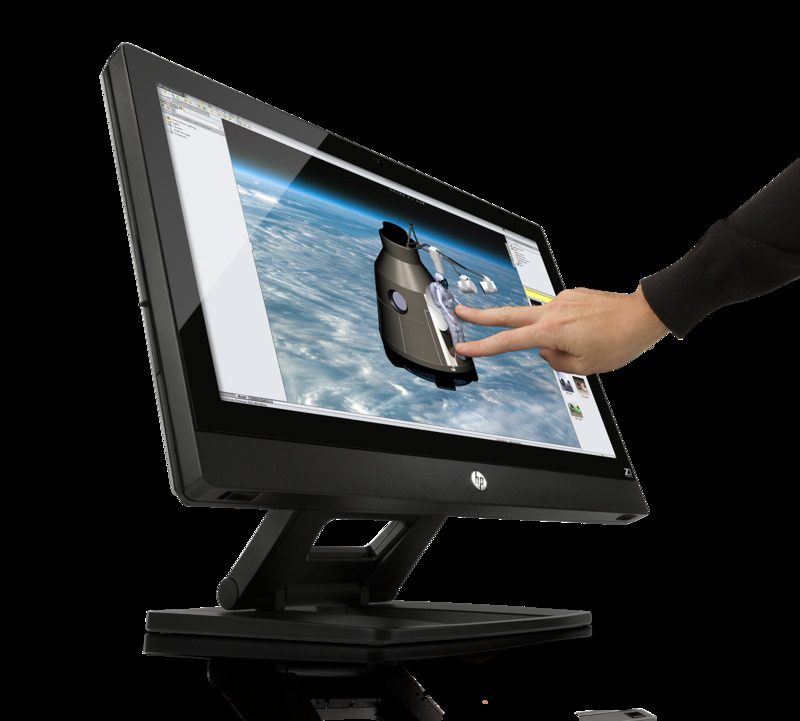 Thunderbolt enables cutting-edge creative work, and the addition of this technology to the HP Z1 G2 expands HP’s leadership in innovation and demonstrates its commitment to the professional market. The HP Z1 features Intel integrated HD Graphics, 4th Generation Intel Xeon® and Core™ processors,(2) ECC memory,(3) and RAID storage options,(4) providing users with more reliability and performance. Additionally, the HP Z1 features the latest NVIDIA Mobile Quadro GPUs for professional use and the best graphics performance for demanding applications. All HP Z Workstations are tested and certified for professional applications. Columbia University’s Graduate School of Architecture Planning and Preservation is regarded as one of the most important, innovative and prestigious architecture schools in the world. As one of the first architecture schools to provide individual workstations for every student, it always has been a leading program in uses of design technology, including the use of more than 100 HP Z1 Workstations. The power of Thunderbolt. Connect in a flash with up to four times USB 3.0 bandwidth using optional high-performance Thunderbolt 2.0 ports located on the side of the HP Z1G2. Professional display. Let ideas shine on the HP Z1 G2’s brilliant next-generation, 27-inch diagonal IPS display. Choose from 10-point touch with stunning edge-to-edge glass or non-touch with antiglare capability. Tool-less chassis. Change most parts or make upgrades without tools or a service technician. Simply snap open the chassis and customize as needed. Bold and bright. A wide range of 3-D professional graphics options, including NVIDIA Mobile Quadro GPUs, gives users the power they need to bring their creations to life. Astounding sound. Premium audio features on the HP Z1 G2 Workstation include dual-tone, front-facing speakers and DTS Studio Sound Audio. (1) Thunderbolt is new technology. Thunderbolt cable and Thunderbolt device (sold separately) must be compatible with Windows. To determine whether a device is Thunderbolt Certified for Windows, see https://thunderbolttechnology.net/products. (2) Multi-Core is designed to improve performance of certain software products. Not all customers or software applications will necessarily benefit from use of this technology. 64-bit computing on Intel architecture requires a computer system with a processor, chipset, BIOS, operating system, device drivers and applications enabled for Intel 64 architecture. Processors will not operate (including 32-bit operation) without an Intel 64 architecture-enabled BIOS. Performance will vary depending on hardware and software configurations. Intel’s numbering is not a measurement of higher performance. (3) Maximum memory capacities assume Windows 64-bit operating systems or Linux. With Windows 32-bit operating systems, memory above 3 GB may not all be available due to system resource requirements. (4) RAID configuration is optional add on feature and requires a second hard drive. (5) Estimated U.S. street prices. Actual prices may vary. Intel, Xeon, Core and Thunderbolt are trademarks of Intel Corporation in the U.S. and other countries. Microsoft and Windows are U.S. registered trademarks of Microsoft Corporation. This news release contains forward-looking statements that involve risks, uncertainties and assumptions. If such risks or uncertainties materialize or such assumptions prove incorrect, the results of HP and its consolidated subsidiaries could differ materially from those expressed or implied by such forward-looking statements and assumptions. All statements other than statements of historical fact are statements that could be deemed forward-looking statements, including but not limited to statements of the plans, strategies and objectives of management for future operations; any statements concerning expected development, performance, market share or competitive performance relating to products and services; any statements regarding anticipated operational and financial results; any statements of expectation or belief; and any statements of assumptions underlying any of the foregoing. Risks, uncertainties and assumptions include the need to address the many challenges facing HP’s businesses; the competitive pressures faced by HP’s businesses; risks associated with executing HP’s strategy; the impact of macroeconomic and geopolitical trends and events; the need to manage third party suppliers and the distribution of HP’s products and services effectively; the protection of HP’s intellectual property assets, including intellectual property licensed from third parties; risks associated with HP’s international operations; the development and transition of new products and services and the enhancement of existing products and services to meet customer needs and respond to emerging technological trends; the execution and performance of contracts by HP and its suppliers, customers and partners; the hiring and retention of key employees; integration and other risks associated with business combination and investment transactions; the execution, timing and results of restructuring plans, including estimates and assumptions related to the cost and the anticipated benefits of implementing those plans; the resolution of pending investigations, claims and disputes; and other risks that are described in HP’s Quarterly Report on Form 10-Q for the fiscal quarter ended April 30, 2013 and HP’s other filings with the Securities and Exchange Commission, including HP’s Annual Report on Form 10-K for the fiscal year ended October 31, 2012. HP assumes no obligation and does not intend to update these forward-looking statements.